The fishermen tucked the bag of dog food into a shelf of the little weather shelter on the boat deck. They thought it was safe, but the crow patrol discovered this treasure. 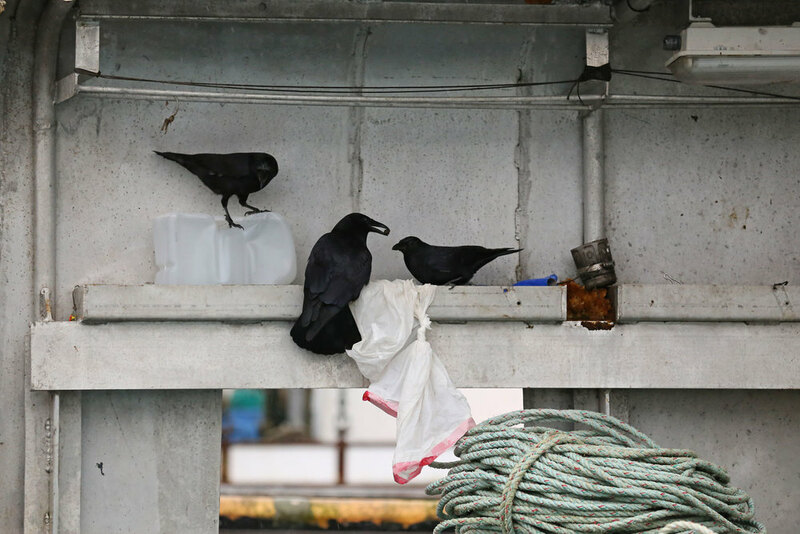 A plastic bag is no match for a corvid. Things got a little bit busy then. The flocks quickly and quietly assembled to make off with the goods. For the most part the feast was peaceful. Crows and ravens came in, quickly scarfed down what they could, and left. There was some feather tweaking, though. ...and at least one knock-down, drag-out. In between those distractions everybody pitched in to remove all of the dog food before it became soggy in the damp weather. Most of the birds left happy. The dog was not available for comment by press time.